Gaara Arts is a group of women who also happen to be Broken Hill artists. Since forming in 2008, they have become an independent, incorporated entity, producing prolific work. 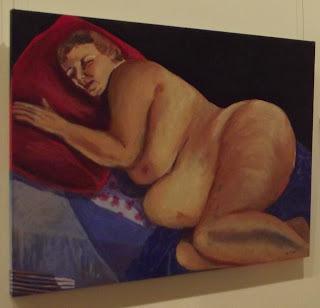 Primarily, they respond to issues that face women in society by raising community awareness of these issues through exhibitions of their artworks at the Broken Hill Regional Art Gallery and other public venues. Biannually, an exhibition is timed to celebrate International Women’s Day on March 8. In 2012, the theme of the International Women’s Day exhibition is “Plastic Lives – A Woman’s Tale”. The 40 works of art on display, in a variety of media, reveal a wide interpretation of this theme. Add to this, an innovative move into multimedia and the scope of interpretation is broadened even further. Each painting has been thoughtfully assessed by a poet who has then written an ekphrastic poem which seeks to interpret and, sometimes, confront their subjects. Local Broken Hill poets joined with metropolitan and interstate scribes to compose their works which will hang beside the paintings in the main gallery of the Regional Art Gallery in Argent Street. One such poet is Sheryl Persson, an ekphrastic poet who transcribes visual art into poetry. Sheryl’s poetry group, DiVerse, performs regularly at the National Gallery and the Art Gallery of NSW. She has written a collection of poems, Scarcely Random, and has had articles and stories published widely. Sheryl will join other poets and the Gaara artists in at the Gallery for the opening of the “Plastic Lives” exhibition at 6.30pm on Friday, March 9. The exhibition will run until April 22nd. Betty Pearson is the President and Angela Fitzpatrick the Vice-President of Gaara for 2012, while established artists such as Jenny Cattonar, Deirdre Edwards and Wendy Martin act as mentors for other emerging painters. The group is hoping to repeat the success of the opening of their previous exhibition, “One Barrow, One Shovel”, which attracted 200 people to the art and memorabilia show in December last year. All I can add is that I wish I could be there on the opening night. Luckily I will be back in Broken Hill at some point during the exhibition nonetheless, so I can’t wait to see it, it sounds quite fascinating. Really enjoyed the upstairs exhibition by emarging artist Jade Manly - the exhibition was called Interactions - very interesting!